In rechargeable batteries, ultra-thin material sheets are crucial. Reactions occur at the interfaces of these sheets. Scientists want to track these reactions. They need a way to probe buried interfaces with elemental specificity. In principle, soft X-ray spectroscopy techniques could be a powerful tool for probing such complex interfaces. However, these techniques haven't been available due to limitations in optics and laser sources. For the first time, an international team devised a soft X-ray second harmonic generation technique and used it to characterize individual layers of graphene inside a graphite sample, promising to open new vistas into the nature of complex interfaces. Knowing how reactions occur at buried interfaces is crucial for energy storage, water purification, and other uses. The new technique offers a way to probe specific elements at buried interfaces. The results from the technique could, one day, let scientists use soft X-rays to track interfacial processes occurring in a quadrillionth of a second. Understanding the detailed nature of complex interfaces has become a quest of profound significance, as it underlies urgently needed advances in many applications, including water purification, desalination, and reclamation technologies, and is vital to central processes in electrochemistry, atmospheric chemistry, biochemistry, and energy conversion. Scientists developed a new technique to probe interfaces with both surface and element-specific selectivity, demonstrated for the individual graphene layers within bulk graphite. When soft X-ray pulses from a free electron laser enter the material, they excite inner-orbital electrons in the carbon atoms. 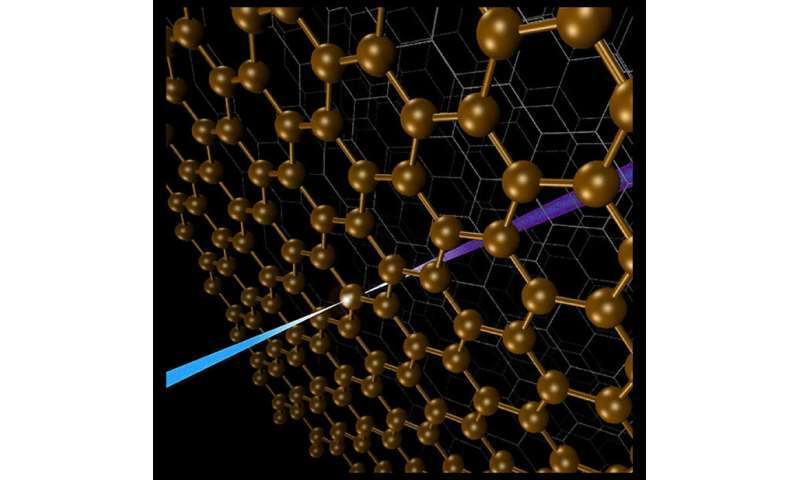 For carbon atoms making up a graphite interface, these excitations can produce a photon (a packet of light) with twice the energy of the incoming photons. Scientists can use observations of this second harmonic generation to elucidate important interfacial properties, as well as chemical reactions occurring on these interfaces.